Development of new analytical methods and subsequent implementation in field studies for the quantification of toxic, chemically reduced nitrogen compounds, produced on three-way catalysts and emitted in the exhaust of in-use motor vehicles. Semiconductor-catalyzed atmospheric photochemistry of isoprene and implications on secondary organic aerosol formation, in collaboration with Prof. Michael Hoffmann (Caltech). Development and field-deployment of high precision spectroscopic instrumentation for greenhouse gas (GHG) monitoring. Chemical molecular recognition of phosphite, a reduced form of phosphorous that is attracting much attention to its potential role in bacteria metabolism in anoxic environments, using a specific molecular probe coupled to a luminescent reporter system, integrated into a miniature, low-cost, spectroscopic instrument. 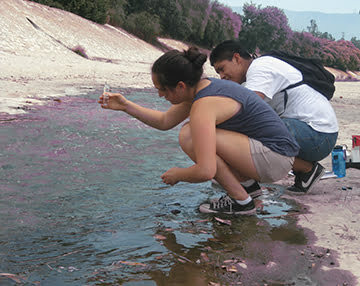 Long-term monitoring of chemical inputs to the Arroyo Seco, an urban watershed running through the city of Pasadena, and investigation of the impact on water quality and microbial conversion of chemical species, carried out through the SRC program. This research is conducted exclusively by high school students and teachers.